Excuse the short introduction to this recipe, but I’m packing my bags and heading to Portland, Oregon, to hobnob with the vegan and famous at Vida Vegan Con. I’ll be giving a food photography presentation, speaking about blog monetization with Nava Atlas, and participating in a panel on privacy and oversharing with Dreena Burton, Joanna Vaught, and Sayward Rebhal. 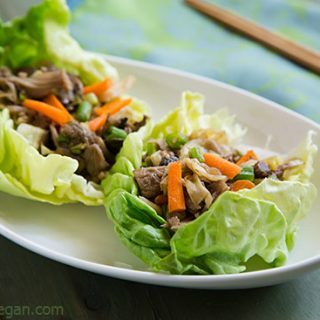 Before I go, I wanted to share a traditional Chinese recipe that I lightened up with the use of jackfruit. You may remember young green jackfruit from my Jackfruit “Crab” Cakes; it’s an Asian fruit that is used as a vegetable when it’s green. As it cooks, it starts to flake and shred, becoming eerily reminiscent of the texture of pulled pork, without all of the antibiotics, cholesterol, or animal suffering. Its shreddy texture is perfect in this Mu Shu Jackfruit, absorbing all the sweet and salty flavors of the sauce while having a much lower calorie and fat count than the original. 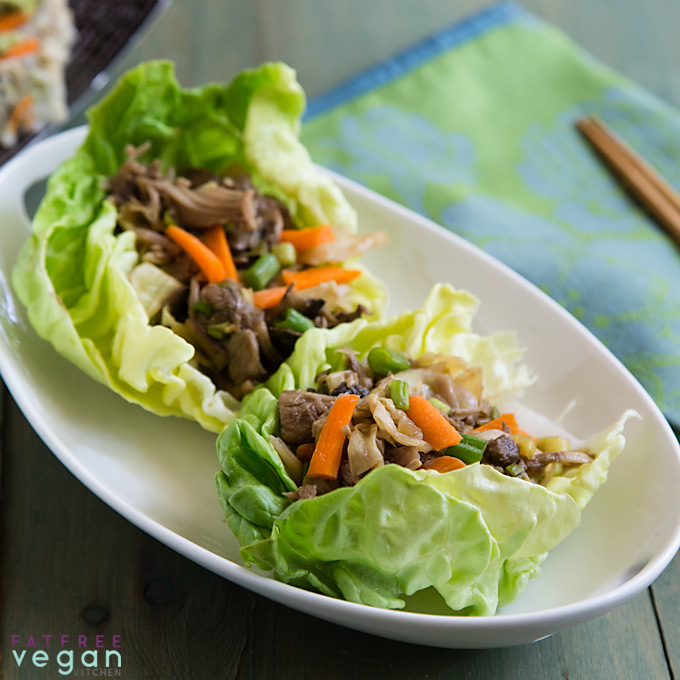 I also substituted lettuce leaves for the traditional mu shu pancakes, making this main dish much lighter and fresher than its namesake while still just as flavorful. A Note About Gluten: The hoisin sauce I used contains wheat, but if a wheat-free version exists, you could make these gluten-free (you’ll need to check your soy sauce, too). Look for cans of young green jackfruit in Asian grocery stores, but be sure it’s packed in water or brine, not syrup. 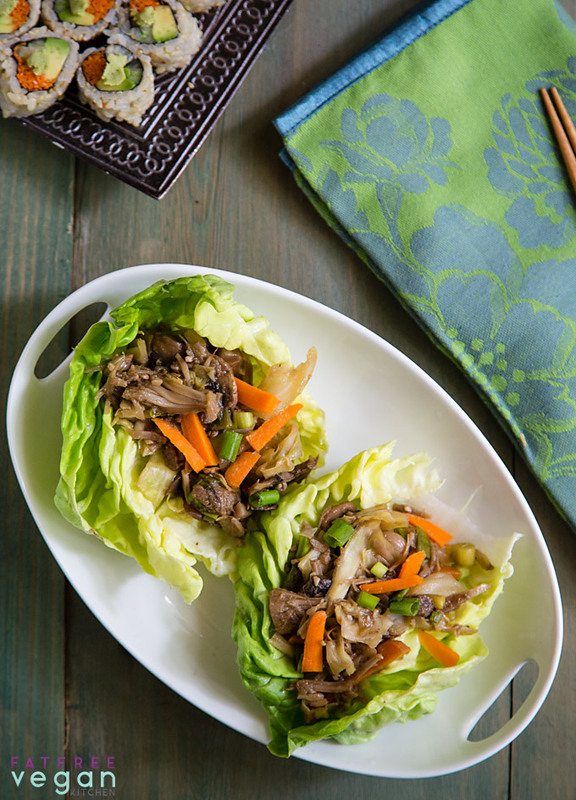 You can make these light wraps more filling by adding cooked edamame or soy curls. On Weight Watchers’ Freestyle program, one serving is 1 point with or without the sesame oil, as long as your broth is fat-free. Interested in More Jackfruit Recipes? Check out Jacked-Up Vegan Ribs and Jackfruit Crab Cakes. This post contains Amazon affiliate links. When you buy something through them, I receive a commission that helps pay the bills. Thanks for your purchase! I am loving your unique ways of using jackfruit, Susan. Have fun! Thank you, looks delicious for summer! Can we also have the recipe for the beautiful inside-out sushi rolls in the background? 🙂 It looks like you use brown rice and I’d so love to know how to use it for nori rolls! Congratulations on your presentation! I can’t wait to try this fun recipe. Kikkoman makes a gluten-free soy sauce. I’ve seen other brands online as well. There are also some gluten-free hoisin sauces out there too. I haven’t seen jackfruit around here, but haven’t looked in awhile. Will have to check around because I’d love to make this. Yum! 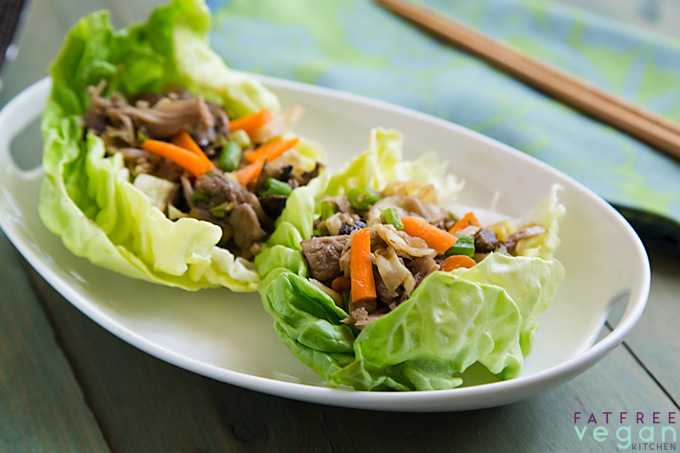 Lettuce wraps. Of course! Why didn’t I think of that?! I finally got around to experimenting with Jackfruit this weekend. http://aveganobsession.blogspot.co.uk/2013/05/pulled-pork-jackfruit-with-fresh.html I loved it! I am going to stock up on a few cans, and put your recipe on the list to try. thanks! Enjoy Vida Vegan Con. (jealous!). I am definitely going next year..hook or by crook! or should that be crock? This is a unique recipe. Have fun in Oregon and good luck with presentation! Wow, have fun at the event! Sounds like it’s going to be good. I LOVE Dreena. So very cool that you get to work alongside her. The last time I tried cooking with jackfruit, it was a huge failure! I definitely need to give it another shot, though… your recipe might be my saving grace. I’ve had problems with it, too. For one thing, it can be tricky to get it the right softness. If I cook it too long, it seems to lose all its chewiness. I think the trick is not to expect it to shred as it cooks but to cut it up beforehand. Also, it’s so low in calories that it is much more filling when used with something heartier, like a legume or a grain. I posted your website on Dean Ornish’s website: http://www.ornishspectrum.com/ and lots of people commented on it! I think it’s one of the best, and I always look forward to your new recipes. Thanks so much, Sharon! I appreciate the support. I made this and we both loved it. I’ve been buying and cooking jackfruit every week since you posted this! Most recently I’ve used it for southern fired ‘chicken’. Going to work on a fat free version soon, southern baked chicken I guess? This is a long shot, but do you happen to have any tips for working with *fresh* (unripe) jackfruit? Specifically, do you know if the cooking times are significantly different between fresh and canned? Love your recipes and just found your site today. I’m definitely checking back regularly for my fat free vegan meals! I wish I could help, but I’ve only worked with the canned jackfruit. I’ve seen them fresh and they look so intimidating, but I’d love to know how to use them. I m very proud of this site.. n..Chennai Jackfruit fest.. because..In Kerala Malayali not done this.Malayali not know the value of JACKFRUIT..
Susan, could I use fresh jackfruit, as opposed to canned? I think you could, as long as it’s a green jackfruit (not ripe or sweet) but I haven’t actually tried it. Loved this, new to plant based eating and always trying to find interesting things to cook or old favourites just made without meat. Didnt have hoisin sauce so used a smoky bbq sauce and added some asian 5 spice I sustituted the cabbage with Kale as that is what I had in the fridge, topped with some toasted sliveredcalmonds for crunch and sliced fresh chilli.